Hi everyone. 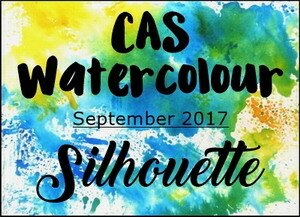 A reminder for the CAS Watercolour September Challenge - Silhouette. My card starts with the Inka Gold background. I smooshed Rose Inka Gold along with Brushed Corduroy re-inker. It's a different colour combination for me, but I love how it turned out. I then stamped script randomly over the background for some more interest. 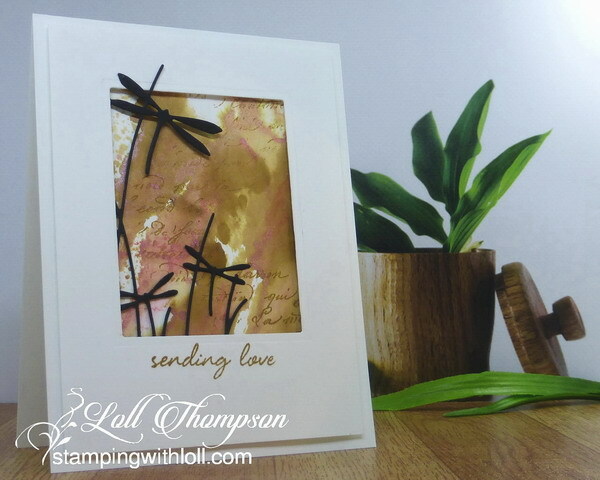 I used a corner die-cut with dragonflies, cut from black to be my silhouette. I framed it in white and stamped a sentiment. We are already over half way through the month. There's still just over a week to play along with our challenge before it closes. There are AMAZING entries in our gallery. Come check them out and see the reminder cards from the Design Team and our wonderful Guest Designer, Birgit. Wow! I just love the different coloured background here Loll. So gorgeous. The dragonflies in black just pop perfectly. This is my all time favorite color combination! Love the brown with a hint of rose/red/pin in it. I have this die and love how you used it in the frame as a silhouette. Thanks again for all the inspiration! I love this Inka background and I know it has a beautiful shine! The black dragonflies are so pretty against it and framed in white! It is a different combination but I love it, Loll. And it looks great with the dragonflies. Unusual colours but they work so well with the dragonflies! 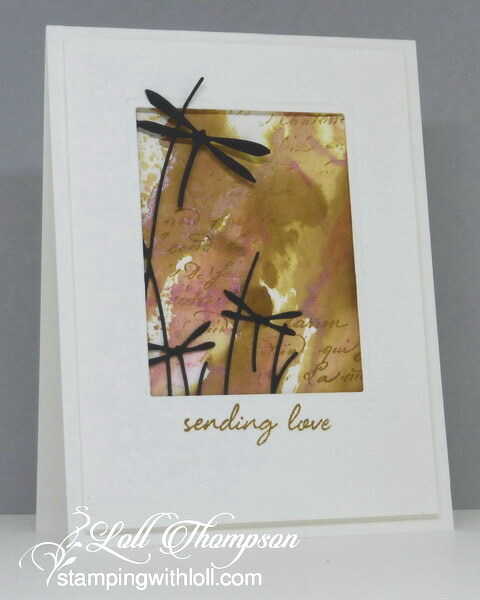 Love the Inka Gold smooshing and the subtle text stamping! That background is beautiful and I like how you combined inka gold and reinker to make it. The silhouette is lovely against it. Wow Loll - love your background colours and the drama of the silhouette against it is marvelous. I love the soft background and colours you've used. Love how this turned out Loll...the hints of gold are fab!! I love the script bkg too...wish I would have bought that die too. you always inspire so many with your great work. Loll, I love your beautiful background with the muted colours, it makes the perfect backdrop for the delicate dragonflies. Beautiful! That die is on my wish list, and you have featured it beautifully. I like the subtle script added to your watercolor background. TFS.